Regain your independence and improve your quality of life with this useful extendable shoe horn. If you have trouble bending, or are dealing with chronic pain, stiffness, or limited mobility, this extra-long shoe horn is an ideal addition to your daily routine. With a long-handled shoe horn from Easy Comforts, you’ll be able to quickly and easily slip on your shoes without struggling or risking injury. 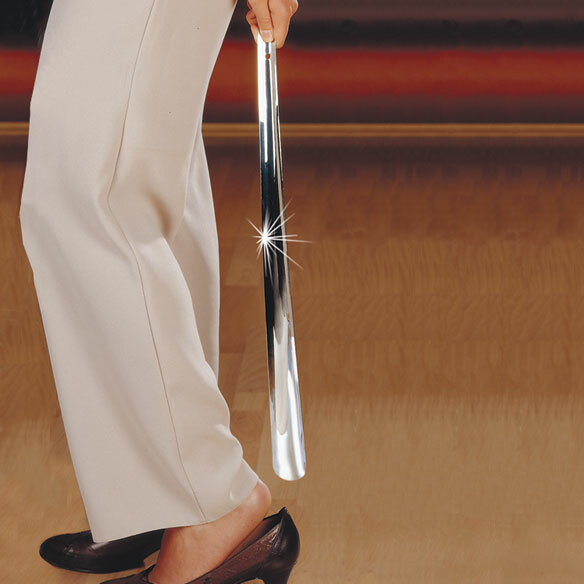 Our long-handle shoe horn is made of strong stainless steel, designed for the ultimate in durability and specifically crafted to avoid damaging your shoes. The long shoe horn has an easy-grip shape and is extremely lightweight (just 6 oz) despite its extended handle. No assembly required; the stainless-steel shoe horn has one-piece construction and no extra parts to worry about. Measures 20 1/8” long. I had back surgery and this is a wonderful help to me. Thank you for making it. Wish I had found these earlier. Strong and very comfortable to use. Don't use boots, but think they would be perfect. Long Shoe Horn is a confort to life. If you have trouble lifting your legs or putting one boots without zippers this is perfect for all ages. My husband has serious knee problems and this shoehorn allows him to put on his own loafers. the help of his shoehorn and sock puller. My husband loves this shoehorn! My husband has back problems and has a hard time bending over to put on his shoes. Well I bought him this shoe horn and he loves it! He even bought one for his Dad. He can put on his shoes without having back pain and without bending over all the way. I recommend this product for anyone who has back pain or hip replacements. I have bad back and can't always bend easily, so this is perfect. I can put my own shoes on now! I have had several plastic shoe-horns and they all split of break eventually, so for quite a while I have been on the lookout for a metal one. This one is sturdy metal and long enough that I don't have to bend over to use it. My husband has been wanting a long handle shoe horn for a long time. As he gets older it is much harder to bend over and put his shoes on. He is very happy with the product and it should last a life time. It is a sturdy but lightweight shoe horn. Order one, loved it. Ordered a second one. The price is very reasonable.Keeps life simple. My Husband has been looking for a long shoe horn, but all we could find was plastic ones. Was so glad to finally find one that was steel! He really likes this! Thank you have having this great product! Easy to use and makes putting my shoes easier. Makes putting on my shoes so much easier. This is the greatest thing since sliced bread. No more bending over to put shoes on. Just slip it in your shoe & your foot slides right in. My back is happy no straining. Protects heels on shoes from breaking down. Purchased for my elderly mother and she said that it is much easier to put on her shoes that need a shoe horn now that she does not have to bend over. This one will do for needed assistance. Just what we were looking for & sturdy too!! Having arthritis in my knees makes it painful to bend my knee up to fix the back of my shoes every time I have to put them on, which is frequently since I take my shoes off at the door. This shoe horn allows me to slip on my shoes easily, every time. No pain, no swearing ! In fact, I'm purchasing another one for a friend who goes through the same thing ! I have bad knees and 2 missing toes. This makes it so easy to get my shoes on without a struggle. It was perfect, just what my husband wanted. My husband kept complaining that his heel wouldn't go in his shoe.I told him he needed one of those long shoehorns that I had seen in your catalog.He didn't believe me that it would work~~Well now he wouldn't be without it. we got one of these shoehorns and were so impressed with how easy and helpful it was to use, we ordered 2 more. They are at every spot we put shoes on! Don't ever want to be without them. My husband has a bad back and bending over is difficult. Now he can put on any kind of shoe without having to bend over or sit down. Been looking for a long time! I had lower back surgery in June and I also have arthritis in my knees...my husband has lymphedema and hobbles around...it is getting progressively harder to put on shoes, much less tie them. I bought shoe horns for myself and husband a few months ago..(you know men, they seem to think everything in the house belongs to them--I don't want to have to look for it when I need it, so I bought 2)....and bought this one for my daughter for Christmas. She will become pregnant eventually and will LOVE this shoehorn! So happy that you carry this item! Makes putting shoes on so much easier for an older person! Great quality product at a reasonable price. The plastic one my wife used broke so a replacement was needed. Came across this item so I gave it a try. I would recommend this item to anyone. No more bending over to hold up the back of my shoe while I'm putting it on. I use this shoe horn every single day. It doesn't bend & it won't break. My foot slides into my shoe with no effort. I would recommend this to anyone who wants a faster, easier way to dress their feet. IT SAVES TIME PUTTING SHOES ON ESPECIALLY IF YOU HAVE TROUBLE BENDING OVER. I would recommend this to others. I bought this for family members for ease of putting on their shoes without assistance or bending over. Money well spent. would recommend to any one who has difficulty putting on shoes. Gave me more independence. Won't break like plastic ones will. Lightweight but heavy enough to keep my cats from turning it into a toy to hide like they did with my short, plastic one. Should last a lifeime! I purchased this for my husband who has some physical limitations. His old plastic one cracked and we had a hard time finding a replacement. Since getting this, I no longer have to help him put his shoes on.Such a simple thing really, but it has given him back some independence. Long so I don't need to bend over. Stainless steel so it is unbreakable and last a lifetime. I brought 4 of them. This shoehorn is of EXCELLENT quality stainless. Perfect weight, solid, and will easily last a lifetime (unless you maybe use it for a crowbar!). It definitely saves from smashing down the back of the shoe at the hee. Easy to use without bending over. well worth the money ! very happy with it,well made and strong,,just what we wanted. Had back surgery and bi-lateral hip replacement and can't bend to put my shoes on. The great thing about this shoe horn is that it is made of metal. My husband had a plastic one, which broke quite easily. I have been waiting for this product. Love it!! This shoehorn is great. It's metal and should last forever! It makes getting the back strap up on my shoes easy. I appreciate the help! It's very helpful, for my husband to use. Hip surgery made if difficult to put on shoes. This shoe horn is a blessing. Giving the extra length so I don't have to bend over to get my shoe on. Well designed/long enough for us oldsters to use easily! Shoe horn makes it so easy to put on my shoes without much effort. Great for those of us with arthritic stiffness and difficulty bending. Makes putting on shoes so easy. It is a perfect length to extend reach to shoes without bending. Gave one of these to older friends, they absolutely loved it!!! I thank God for this wonderful tool several times a day! So much quicker, easier, and less painful than before. Been looking for a metal long-handled shoe horn. The plastic ones crack easily. Had a plastic one break in less than a week. This will last forever. The edges are smooth; do not catch on socks. Could not be happier. I use the shoe horn to help reach the shoe string and tie them. When putting on my braces it pulls the straps closer so I could reach them and sometimes I use it to scratch my lower leg or back. IN OUR SUITCASE AND DON"T HAVE TO WORRY ABOUT GETTING OUR SHOES ON..
Great shoe horn for individuals with mobility issues. I bought this shoe horn for my husband who has mobility issues when putting on his shoes. This shoe horn works great, easily slips his shoes on now without any problems. Terrific Find. I would buy another long shoe horn. Helpful, Good to have another in other rooms. So you don't have to go looking for it. As a person with a bad back, this is a very handy tool to have around the house. We use this shoe horn every day. Love having this close to the door, making on and off shoes so much easier. I love the product. Especially if you can't bend, it makes it easy to put your shoes on. I would recommend this product to friends. We bought it for my husband to help him get his shoes on. He loves it and uses it every day. He also can scratch his back with it. I told my mother about it also. I had a long shoe horn which was, unfortunately, made of plastic. It broke after a couple of uses. I have severe arthritis and am unable to get shoes on without hurting my old aching back more than usual. This made of steel shoe horn will last as long as I am wearing shoes, I hope. No moving parts, nothing to maintain, and I'm happy with the purchase. Bought as a joke for my husband years ago. But everyone who comes to our home just loves it. So bought 3 more this year as gifts! Even my 3 year old granddaughter uses it! No more Bending & Straining! The device is a back-saver. It makes putting on your shoes a breeze. If you have arthritis, it will pay for itself many times over! Most helpful with both knees replaced and hard to bend over to put shoes on. Have one at each door. Already bought a 2nd one for a family member. Love this - already ordered a 2nd for a family member. Sturdy and lightweight. Exactly what I was looking for! Keeps her from bending over so much to put her shoes on. It's long so I don't have to bend over. My husband enjoys having this to help him get his shoes on, since he's been diagonosed with Parkinson's. Nothing is perfect, hubby bent the one he has but I find them great. I like the length. It helps if you have back trouble. It is sturdy and long enough. But i thought the edges were rough, so I wrapped duck tape around the top . This purchase was the second purchase of this item. Got this for my elderly mother. Very handy product. Lightweight and easy to pack, this is a great tool to assist in putting on shoes without bending down the heels as too often happens otherwise. After my hip and knee replacement, I needed slip-on shoes as I healed. Horns work good in getting the shoes on and save wear on the back side of the shoes. These extra long horns helps the reaching and bending. Use for travel is limited. Won't fit in small cases and I wouldn't advise packing one on a plane. product very useful, only con was that the edged were rough, I had to sand them down so edges were smooth. Gifted to my brother-in-law who was thrilled with it. Since it is difficult for me to bend over, having the extended reach and sturdy construction of this product is very helpful when putting shoes on. My 80 year old Mom loves it! My mom was having trouble getting on her shoes after a Back Injury.. This shoehorn was a great help! Got this for my Dad as he had a plastic one that broke. I believe the stainless steel one will last a lot longer and he seems pleased with it. Love it! Wish I 'd had it long ago. Bought for my mother to use when her feet swell. Keeps her from having to bend. Could be longer for tall people. A big help to make life easier! I bought some new slippers that come up to the ankle. I couldn't get my foot in all the way. This shoe horn helps tremendously!! This is not a pretty shoe horn, but the one it replaced broke. This one won't ever break.. It does what it is supposed to do and is easily used. I gave this to a friend whom I had given a MK shoe horn several years ago. This was nowhere near the quality of the previous item. It bent out of shape and was useless after a few months of use. I will not buy another one. I use it for slipping on my shoes as I have swollen feet and almost impossible to bend down and use my fingers to assist slipping on . Weak thigh muscles after knee replacement make me use this item. I like the long handle on this shoe horn however the first time I used it the metal bent. I'm concerned that the metal is so soft that it will eventually break. the concept is really good but I use them for kids and the plastic one I have with the same length handle feels better. It was a gift. It bent on the first use. Very embarrassing. It does not look like the photo. Most shoe horns are cupped to approximate the shape of the heel. This is just a sheet of metal with a groove in the center. Like someone just took a strip of sheet metal and gave it a little fold. It actually hurts to use it. Length is good. I bought it to help with my boots, for which a regular show horn is too short. Maybe the positive reviews are for a previous design. It bent when I used it in my work boots. It is very thin. It did work with my dress shoes. so badly shaped that it cuts your heel. It's basically a flat piece of metal with a slight bend put in the middle. Too expensive to return. A paint stirring stick would work better. Save your money & buy a good one!!! This product should be improved or discontinued. When I first attempted to use this shoe horn, it bent rather easily. Seems to be made of a very flimsy material. can not bend over to put shoes on. To help me to put my shoes on. Hip replacement. Hard to bend over. I cannot bend enough to hold shoes & to get them onto my feet. My mother has a difficult time reaching her feet and getting her shoes on. I have 2 hip operation, need the length of a shoehorn to put my shoes on. My husband needed a long shoehorn. For elderly mother who can’t bend down to put shows on. I need this for myself to use. I have one and love it picked it to hep\lp my sister put her shoes on easier. My friend needs a long metal shoe horn to help him get the boots on he wears daily. my husband needs the longer shoehorn, he had a plastic one that cracked after a while, I think the stainless steel will be perfect. father in law with back and neuropathy problems will find helpful to dress self. My husband had a knee surgery leaving it difficult to put on the shoes. This should help and it's stainless steel! I require this to assist me in putting on my shoes. To assist a loved one who has difficulty bending to put shoes on. What type of handle does this shoe horn have? Picture does not show a full picture. BEST ANSWER: Hi Shopper. I bought this shoe horn for my husband to use after his hip surgery. He loves it. He has quite a few different ones, but this is his favorite. It doesn't have a actual handle, it just curves at the top. He said it's easy to grip and his shoes slide on without any trouble, because it's long. Hope this helps answer your question. The top of the shoehorn is curved to allow your fingers to slip into it easily. It also has a very small hole for hanging on a wall. It is very sturdy and I highly recommend it. Yes, toward the top of the handle is curved (like a hook). So you can hold onto it securely. Hopefully it will help your mom put on her shoes easily. The top of this shoe horn is curled into hook so you can grab it or hang it up. I am very pleased with it. It's just what I wanted. I just received three of these great shoe horns. YES, they have a great curved end...not a straight one! These are the BEST! Didn't answer my question. What does the top of the shoe horn look like? Cannot see it in the picture. the reviews say the same. It still does not answer the question. BEST ANSWER: it has a slight curve to it. it helps me to grip it. The shoe horn has a hook so it can be hung up. It is bent in a hook shape like a J hook.